David Hamann began his karate training on October 31, 1973 at the age of 20 under Sensei Phillip Koeppel, Shorei-ryu Chief Instructor. Hamann enrolled in the newly opened Pekin, Illinois dojo, one of several schools Sensei Koeppel operated across the central United States. Soon after his promotion to yellow belt, Hamann began business management training with plans of some day operating one of Sensei Koeppel’s schools. For the next six years Hamann studied karate under Master Koeppel and his black belt students. Hamann also began teaching and operated several of Sensei Koeppel’s dojos in Peoria, Pekin, Cleveland, Dayton, and Champaign, IL. During this time, Mr. Hamann traveled the United States Karate Association (USKA) tournament circuit, competing in national and international competitions; taking first place 22 times, second place 11 times and third place 6 times. 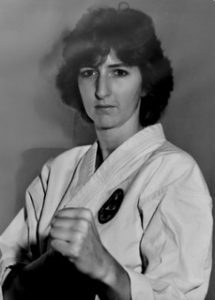 Hamann competed within other organizations including the PKC and AAU, and in numerous Phil Koeppel Schools of Karate inter-dojo tournaments. 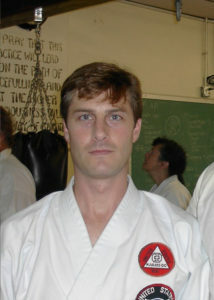 David Hamann left the karate business in May 1980 to pursue a design degree at the University of Cincinnati (U.C.). Upon arriving in Cincinnati, Hamann introduced himself to Shuri-Ryu Chief Instructor Michael Awad, requesting permission to train with him, his brothers and students. 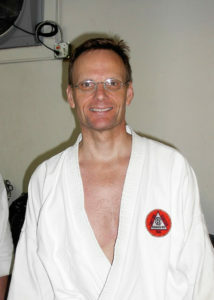 Hamann was welcomed as a standing member and instructor at Sensei Awad’s Kosho School Karate School. While attending U.C., Hamann completed design internships in Columbus, Ohio where he organized a karate club and taught for nine months; and in Winchester, Virginia where he taught advanced students at the Tom Glass Karate Club for six months. David Hamann graduated from U.C. in June 1984 with a Bachelor of Science degree in Industrial Design. Upon graduation, he took a position with Index Design Associates in Cincinnati. For the following nine years, Hamann continued to train with Michael Awad and students. 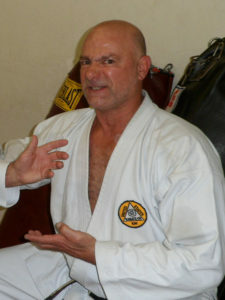 He also maintained a dojo at the design office where he worked – for personal training and occasional employee lessons. In June 1993 David Hamann started his own product design business, David Hamann Design, and in January 1994, with a small group of students, he opened the Northside Karate Club in the historic Northside district of Cincinnati. During this time, Hamann continued to train with Master Koeppel and with the Awad’s, which he continues to do to this day. Though Robert Volz had heard about karate during school in the late 1960’s and early 1970’s, Karate had not yet become commercialized and there were not many dojos in the area. In 1976 he finally got his chance to study. He started with Sensei Michael Awad at the dojo in his Elm Street family home. This dojo was in a large two car garage, a wood deck for the workout area, weights, and canvas heavy bags. During this early period of his training, he was able to meet various famous karate masters who visited the dojo including Robert Trias, Jerry Narlock, Ross Scott and after 9 months of training James McLain visited to help review him and the other students for yellow belt. Sensei Awad was in the prime of his competition career at this time, meaning that the training was always intense. The date 1981 was one to remember, Sensei Awad found a new location for the dojo. It was a lot of work for the main members of the school, but after four or five months of work, they had the Grand Opening. The new school was open to the public, and much larger than the old home dojo. This was a very fine facility, with an expanded workout area, a larger weight-lifting area, locker room and showers. There were many students at this Dojo and Mr. Volz was assigned to teach a class once a week, which was a great experience for him. Sensei Awad frequently invited other schools from the area to come workout with at the group, however they would only come once. They always had a hard time making it through the workout. At the end of the session, everyone would kumite, Sensei Awad would always pick out the toughest or the highest rank to spar first, and would knock the wind out of them or knock them down within 30 seconds. In Volz’ words, “I do give those schools credit for coming, most of the schools in our area will never workout with us if they have been invited by Sensei Awad.” It was during this period that Sensei David Hamann, already a black belt under Master Phillip Koeppel in Peoria, IL made his first visit to train at the school. After only a few years, Sensei Awad purchased a new Dojo at 2121 Beechmont Avenue, the current location of the school. No more rent, this Dojo was ours! It was in the heart of town and had a lot of potential, however it was much larger and needed a lot of work. For many months, Volz and the other members worked hard until the school was finally ready. The Grand Opening for the new school was in June of 1983, but it was to be much larger than the previous opening, as Master Robert A. Trias was in attendance. There was a closing ceremony of the old Dojo, with a procession from the old Dojo to the new one. This was a very fine ceremony, following was a seminar and a banquet. It was a nice experience for all those involved. The new Dojo was considered to be one of the finest in the world. Many more students joined and the main core of our Dojo has also grown. 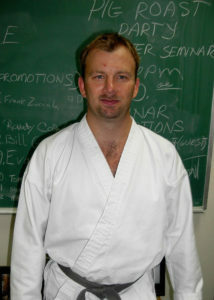 Sensei David Hamann was now living in the area and training at the school regularly. Some of the best Karate men in the country visited the school, and Mr. Volz was there for all of them. This includes additional visits by Grandmaster Robert Trias, Master Phillip Koeppel, Bill “Superfoot” Wallace, Takayoshi Nagamine, John Pachivas, John Jelks, James McLain, Tex Cobb, and many more. The Dojo is not far from Mr. Robert Bowles’ Dojo in Ft. Wayne, Indiana allowing Mr. Volz and the other members to easily compete in his tournaments. Volz was in attendance when Sensei Michael E. Awad won the Grand Champion of Mr. Bowles’ tournament of 1985. In 2013, Sensei Awad retired from actively teaching the martial arts and running the school. In February of 2014, Robert Volz, Sensei David Hamann, and Nate England took over ownership and management of the school. Mr. Volz continues to teach weekly at the school, passing on his knowledge and experience to the next generation. Nate England began studying traditional Okinawan and Japanese martial arts in October of 1995 at the Academy of Okinawan Karate in Peoria, IL under I.S.A Shuri Ryu Chief Instructor, Shihan Joseph Walker. As a brown belt he began joining in staff meetings, and became the school’s student manager. Mr. England studied all the martial arts taught at the school including Karate, Kobudo, Judo, and sword. He was promoted to black belt in August 2000. That year Mr. England entered the University of Illinois in Champaign-Urbana, IL to pursue a degree in architecture. Finding no martial arts groups to train with, he founded the University of Illinois Shuri Ryu Karate Club. 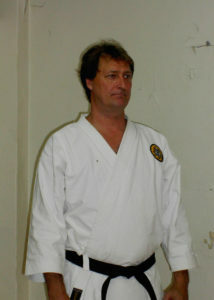 He remained the head instructor of this club until 2007. In 2003 he entered Miami University in Oxford, OH to pursue a Masters Degree in Architecture. From 2003-2005 he ran the Miami University Shuri Ryu Karate Organization. Both of these University clubs produced many excellent karate practitioners. During his time at Miami University, Mr. England would occasionally make the trip from Oxford to Cincinnati to train at the Kosho School of Karate. In order to further his training and understanding of traditional martial arts, Mr. England lived in Okinawa, Japan (the birthplace of karate) from July 2007 to May 2010. During that time, he was able to train with many of the top Martial Artists in Japan and Okinawa. He spent the most time studying Kishaba Juku Matsubayashi Shorin Ryu with Katsuhiko Shinzato, Shindo Muso Ryu Jodo at the Mei Sui Kan Dojo with Chosho Fukuhara, Iaido with the Okinawan Iaido Club with Tadashi Takeda and Kenji Nakaima, and Shidokan Shorin Ryu at the Shidokan Honbu Dojo with the senior students of Katsuya Miyahira (Including: Meiyu Takara, Morinobu Maeshiro, Minoru Makishi, Seiyu Nakamura, and many others!). Mr. England regularly visits Japan for training and certification. In 2010 Mr. England returned to the United States, landing in Cincinnati, OH and began training regularly at the Kosho School of Karate under Shuri Ryu Chief Instructor, Sensei Michael Awad, Sensei David Hamann, Tom Awad, and the other senior instructors. In 2012 he became the de-facto manager of the school, organizing the schedule and signing up new students. 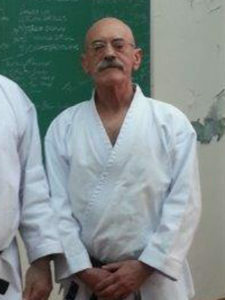 In 2013, Sensei Awad retired from actively teaching the martial arts. In February of 2014, Sensei David Hamann, Robert Volz, and Nate England took over ownership and management of the school. Mr. England has traveled extensively throughout the United States to train with top instructors. He has also traveled internationally including Canada, 6 trips to Japan and Okinawa, living in Okinawa for 3 years, and in 2012 he toured South Africa with Yoshio Kuba, Imtiaz Abdulla, and Miwa Kanazawa to help promote traditional karate in the country. Mr. England also hosts a weekly martial arts podcast, Chop Talk which focuses on Karate, traditional martial arts, and Japanese culture. Guests include Shuri Ryu Chief Instructor Michael Awad, head of the Okinawan Kenpokai and Goju Ryu Instructor Yoshio Kuba, and karate legend James McLain. Mr. Kirchmayer and his son began their karate training together in 1996 at the Rawlings Karate School in the Blue Ash neighborhood of Cincinnati, OH. 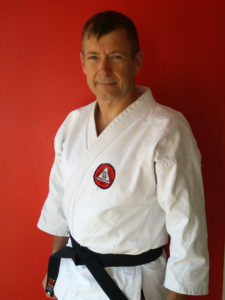 Sensei Oliver Rawlings, 6th Dan (USKA) taught Shuri Ryu karate, and was a student of Sensei John Jelks and Sensei Victor Moore. 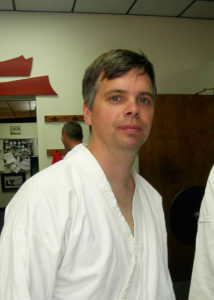 Mr. Kirchmayer was awarded his 1st Degree Black Belt (Sho Dan) by Sensei Rawlings on November 26, 2004. Following the retirement of Sensei Oliver Rawlings, Mr. Kirchmayer began training under Sensei Robert Bowles in Ft. Wayne, IN in 2008. The remainder of his Karate promotions were presided by Sensei Robert Bowles, 10th Dan (ISA) in Ft. Wayne. 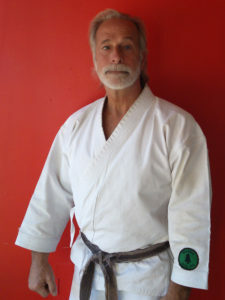 Sensei Rawlings stepped back from actively teaching in 2002, and he passed responsibility for the school to Mr. Kirchmayer, which was subsequently renamed Cincinnati Shuri Ryu. During this period as school head and instructor, he earned several awards at the national level including: The Leadership Award for Instruction (ISA) in 2005, Sensei of Merit Award (International Shurite Yudansha-Kai) in 2009, and Excellence Award in Martial Arts (ISA) in 2013. Mr. Kirchmayer continued teaching and training in Blue Ash until 2017. In 2017, he began training and instructing at the Kosho School of Karate in the Mount Washington neighborhood of Cincinnati, OH. 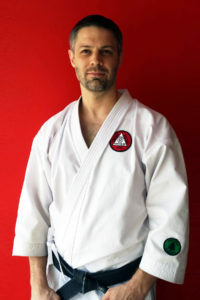 David Swingley grew up with an affinity for martial arts and began his adventure as a karate ka after joining the United States Army, upon graduating high school. His first experience in karate began where he was stationed Ft. Bragg, North Carolina in 1980, under the instruction of Fred Campbell. He would later be stationed in Germany in 1981 and as Swingley was nearing the end of his tour in Germany, he received a letter from his brother, Dennis, who had joined Kosho School of Karate. After only two days upon returning to the United States, he joined the dojo. Through his journey, he worked and attended school full time, served the dojo by performing maintenance and followed his dream of achieving Shodan as his motivation. Swingley received mulitple trophies in kumite and kata while performing in tournaments, including 1st place in kumite in Indianapolis as a 4th Kyu and 1st place in kata at the Cincinnati Tri State National Karate Championship as a 3rd Kyu brown belt. Mr. Awad, along with his brothers Richard and Thomas, began their karate training in 1966 in Cincinnati, Ohio under Shorei Ryu Chief Instructor Victor Moore. Mr. Moore had opened the very first karate school in Cincinnati several years before. Before starting lessons, the brothers visited all other schools in the area before deciding that Victor Moore was, “Tougher than any of them!”, and signing up at his dojo. Mr. Moore’s network of karate schools continued to grow, eventually leading him to relocate from his hometown of Cincinnati. At the same time, Mr. Awad was forced to take a year off of college due to a severe illness. Once recovered, and with plenty of free time on his hands, he saw an opportunity to make some extra money and took a took a job with AT&T in Grand Rapids, Michigan. Fortunately, this was the home of another one of the era’s great karate men, Sensei James McLain. 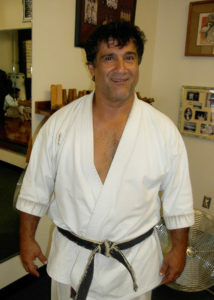 Mr. Awad rented the apartment above the dojo, and began training during all non-work hours. On occasion, he would even call in sick sot that he would not miss a class! During school holidays and summer break, both of his younger brothers would move into the small apartment and join in the training. With his time in Grand Rapids coming to an end, the brothers needed a way to continue their training. On Thanksgiving weekend, they made their first trip to Peoria, Illinois to train with Mr. McLain’s teacher, Master Phillip Koeppel. Mr. Koeppel welcomed them into the dojo and into his home, inviting the three young brothers to join his family for Thanksgiving dinner. 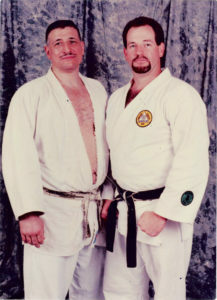 To this day, the Awad brothers continue to study under Mr. Koeppel and are involved in his organization, the United Stakes Karate-Do Kai (USKK). Mr. Awad’s intense dedication to karate and his impressive tournament record began to get noticed around the country. Soon he began regular trips to Phoenix, Arizona to train with Mr. Koeppel’s instructor, Grand Master Robert Trias. Mr. Trias opened the first karate school in the United States in 1946, was the highest ranking karate practitioner in the U.S., and also head off the largest karate organization in the world, the United States Karate Association (USKA). Mr. Awad quickly became one of his most dedicated students, living in Phoenix for several extended periods to further his training. Due to his dedication and skill, Mr. Trias awarded Mr. Awad the position of Shuri Ryu Chief Instructor. In 1976, thanks to his outstanding tournament record, Mr. Awad was earned a chance to join Grandmaster Trias on a trip to Japan, Okinawa, China, and the Philippines. During this trip, Mr. Awad trained and competed in the most highly accredited schools in Asia. In 1979, after training students at their home dojo for approximately 5 years, Mr. Awad and his brothers Richard and Thomas opened the Kosho School of Karate in the Mt. Washington neighborhood of Cincinnati, Ohio. In June of 1983 this dojo was moved to its present, more spacious location. Grand Master Trias, and many more karate dignitaries, were in attendance at this event. The Cincinnati Police Department led a procession from the old dojo during the opening ceremony. Under Mr. Awad’s leadership, this school became regarded as one the finest facilities and group of instructors to be found anywhere. In July of 1983, Mr. Awad and his brothers returned to Okinawa, Japan, and China with their teacher, Grand Master Robert Trias. While in Japan, they paid their respects to the family of Master Yasuhiro Konishi, who had passed away shortly before the trip. Mr. Konishi was Robert Trias’ last teacher, as wells as a major contributor to the development of karate in Japan, the United States, and around the world. During this trip, the Awad brothers met and studied with most of the living authentic Grand Masters of Karate. The highlights of Mr. Awad’s competition career are too numerous to list. They include multiple World, International, National, Regional, State, and Local championships, including the 1986 USKA World Championship in Kata. In 2013, Sensei Awad retired from actively teaching the martial arts and running the school. In February of 2014, Sensei David Hamann, Robert Volz, and Nate England took over ownership and management of the school. Shuri Ryu Chief Instructor, appointed by Grand Master Robert Trias. 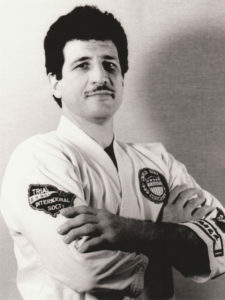 Thomas Awad, along with his brothers Richard and Michael, started training in karate in the summer of 1966 under Sensei Victor Moore in Cincinnati, Ohio. Tom was 11 years old at the time – the youngest of the trio who would stay with Sensei Moore for over a year and a half. Woodrow Fairbanks, John Jelks, and George Davies were all students of Moore at that time, with Jelks teaching Tom and the other brothers their first lesson in karate. At Moore’s school, the brothers met William Heard who was a student of Master Phillip Koeppel in Peoria, IL. Mr. Heard took the brothers on their first pilgrimage to Peoria in the summer of 1967, where they stayed at the dojo. Tom Awad’s first tournament was in Knoxville, TN in February of 1967. At that time, there was no junior division, and needless to say, he took a beating! But he vowed that would never happen again. His second tournament was in Covington, KY in the summer of 1967 at William Dometrich’s Shiai where he fared much better. In the fall of 1967, the Awad brothers met up with Sensei James McLain in Grand Rapids, MI and subsequently followed hi to Cleveland, OH and Bedford, OH. During this time period, the Awad brothers fought and won in dozens of tournaments. During this period, the Awad’s created a training area in the basement of their mother and father’s home in Cincinnati, OH, where they painted Mr. Koeppel’s symbol, a large Double-Bladed Axe on the floor. This dojo was the first incarnation of what would eventually become the Kosho School of Karate. Many great karate men visited this private dojo including Robert Trias, Phillip Koeppel, John Pachivas, Bob Dagliech, Wally Slocki, James McLain, and many others. At one point Milt Calender lived at the dojo. One of the most regular visitors was heavyweight kickboxing champion, Ross Scott, who became Tom’s best friend. During these early years the Awad brothers regularly trekked back and forth to Peoria and around the midwest to train with Koeppel and McLain. The training lasted for days on end, while they slept in the dojo. True dojo bums. In the summer of 1972, Tom and older brother Mike, along with Milt Calander and Justin Howard traveled to Phoenix, AZ to train under Grandmaster Robert Trias. Tom Awad was was promoted to 1st Degree Black Belt in the summer of 1973, and shortly after journeyed back to Phoenix where he trained and taught classes for Grandmaster Trias. The 70s and 80s flew by, as the Awad brothers went back and forth to Peoria and out West, while Grandmaster Trias and Master Trias made numerous trips to Cincinnati. In 1983 he joined his brothers Richard and Michael, along with Grandmaster Trias, on a tour of Okinawa, Japan, and China. 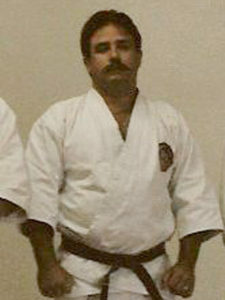 At the 1987 Internationals, held in California, Tom won a bronze medal and fought alongside his Brother on the Koshiki Team. In 1993 Tom Awad returned to Okinawa along with Robert Bowles, and in 1994 visited Ireland with Master Koeppel, Eugene Talbotte, and others in the USKK group. He had a blast training during this period, and still gained 20 pounds from the food! 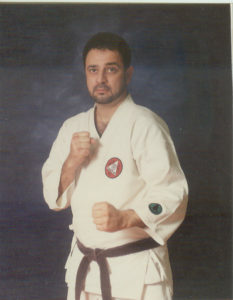 In 1992 he won the USKK’s “Trias Cup” Championship, the highest award given in this organization for kata competition. Tom continued to actively compete in karate for over 30 years, and this tournament record was submitted to the Guinness Book of World Records for recognition of the longest continuous karate competition career. While he had the credentials, unfortunately the category was not added to the book. During his long career he was fortunate enough to sit at ringside during fights between the all-time karate greats including Glenn Keeney, Bill Wallace, Parker Shelton, Mel Wise, Ross Scott, Mike Awad, Joe Lewis, Victor Moore, Chuck Norris, and Artis Simmins, and was also there to watch demonstrations by Bruce Lee. Sadly, Mr. Tom Awad passed away in the winter of 2017 due to complications with Parkinson’s Disease. The disease progressed quickly, as only a few years before he was still training, teaching, and sparring full-force at the Kosho School of Karate. At the time of his passing, Mr. Awad was a 7th Degree Black Belt in Shuri Ryu Karate, a recipient of the Large Double Bladed Axe, Mr. Melvin Wise Award, Mr. Phil Koeppel Award, and an inductee into the Bushido International Society in 1997. Mr. Sastre been practicing martial arts in 1973, under Chester Richardson in the Shuri Open System where he was introduced to basic karate knowledge, procedure and technique. In 1975, he met Sensei Michael Awad and began training with him in Shuri Ryu at his home dojo. 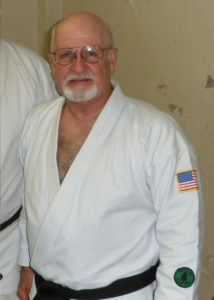 As one of Sensei Awad’s original students, Mr. Sastre has been with the school since the beginning and has seen all of its many changes: The original Elm Street Dojo in the basement of Sensei Awad’s family home, the founding of the small Kosho School of Karate on Sherman Avenue, the relocation of the school to Beechmont Dojo, and the current version of the school headed by Sensei Hamann. In addition to being a lifelong martial artist, Mr. Sastre is also a professional musician, and can be seen with his band, the Bluebirds, throughout Cincinnati. 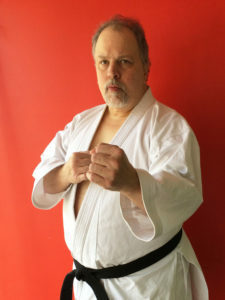 Richard Berwanger grew up engaging in fisticuffs and other antics of sibling rivalry, so it is no surprise that when a friend mentioned joining the Kosho School of Karate, it would spark his interest. He attended a demonstration in 1982 held by Sensei Michael Awad, and thus joined the dojo, training under Bob Volz, Tony Awad, Mike Davis and Sensei Awad. 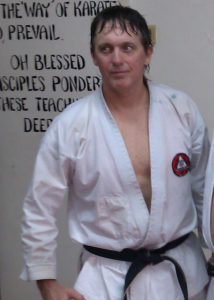 Berwanger would later aid in the opening of the dojo’s Beechmont location, alongside other dedicated members of the school. Through his journey as a karate ka, he would attend seminars held by Grandmaster Trias and perform in tournaments, including his first tournament at NKU where he received 1st place in kumite and the Heart of Illinois Championships, where he would earn 1st place in kumite as a brown belt. As a black belt he was the 1992 & 1993 USKK Heavy Weight National Champion. He was awarded Shodan in March of 1988 and later earned his ranking as Nidan in July of 1990. In addition to his training and competition, Mr. Berwanger was the school manager for 8 years. 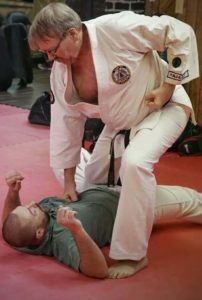 Searching for a karate school during his last year of college, Mike Davis struggled to find a place to call home, until hearing word of a USKA dojo run by the Awad brothers. Accompanied by Mark Sastre, he began his journey in karate at the Elm location of the dojo. The dignity and order of the school was exactly what Davis had been searching for, and as time passed, karate had become a highly significant focus of his life–crediting the practice as being like a father to him, as well as having lead him to meet his wife. His karate adventures found him training in Arizona, learning from fellow karate ka including James McLain, and receiving a belt promotion from Master Trias at the banquet celebration for the Beechmont dojo opening. The group of Mike Davis, Bob Volz, Tony Awad, and Marc Sastre were the first people promoted to black belt at the Kosho School of Karate. 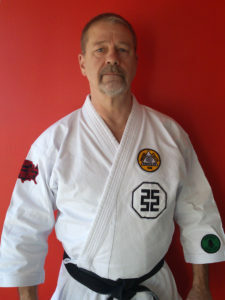 Seeking adventure, Gerald Sexton signed up at the dojo 1981 and began training under the instruction of Mike Davis and Bob Volz, until he received his black dot and could attend courses held by Sensei Michael Awad. Sexton would later begin assisting classes as a yellow belt and grew his knowledge as a karate ka by attending seminars held by Sensei Awad and Grandmaster Trias in Cincinnati and Indianapolis. This included the grand opening seminar of the dojo, where he memorably received a promotion at the banquet and participated in a ceremony, led by Master Trias, to cleanse the school of negative spirits and attract good spirits to the new kamiza. Kim Hagerty had a background of athletics in high school and pursued life as a musician, moving to New York with his siblings and performing as a guitar player. Returning to Cincinnati to marry his wife would lead him to begin his journey in karate, through the influence of his brother in law. He joined Kosho in 1988, attending his first tournament in 1989, where he earned 3rd place in kumite. He would continue training, and also attended seminars and tournaments held by Master Koeppel, Bill Wallace and Sensei James McClain. He earned 1st place in kumite in the USKK Grand Nationals in 1993 as a 2nd Kyu, and was promoted to 1st Kyu in 1994, awarded by Koeppel. In addition to family and fatherhood, Hagerty revered karate as a way to enrich his life, and attributed God and karate as a beacon of light through life’s hardships. Eric Linton began his story as a karate ka in 1986, after a fight his brother had previously gotten into planted a seed of curiosity and inspiration in him. As he progressed on this journey, he had the opportunity to meet and was greatly influenced by Master Koeppel. Throughout his experience as a karate ka, he participated in various tournaments and events, including a 1989 Karate Clinic for kata, kumite, self defense and weapons where Master Koeppel was present. As a brown belt, he achieved his first trophy at the 1994 Seven Star Dragons Youth Tourney, receiving first place. Allyn Raifstanger was brought up with a well-rounded lifestyle, having been involved in choir, marching band, theatre, Boy Scouts and various athletics. 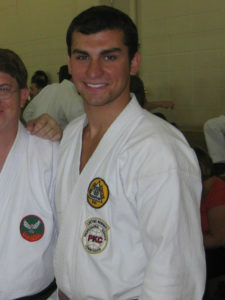 His interest in karate began after finishing his degree and relocating to Atlanta, as he had passed a dojo while out for a run. As his career moved him to various cities, it became difficult to find a place to train, until a new opportunity brought him to Cincinnati. His search for an Okinawan style dojo, similar to schools he had joined in the past, lead him and his father to the Kosho School of Karate. In 1991, Allyn was inspired to seek his own business endeavor, Allyn’s Cafe, and returned to the dojo to complete his training for black belt. Note: We are continuing to compile and update the Instructors List. If you, or someone you know, received a black belt at the Kosho School of Karate but do not appear on this list, please send an e-mail containing your name, rank, photo, and a short karate bio to koshoschoolofkarate@gmail.com. Thank you.